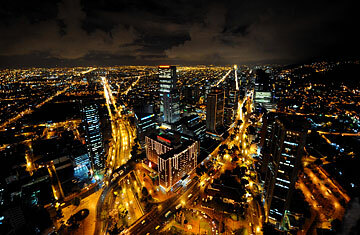 With civil conflict easing, and the cultural, culinary and nightlife scenes sexed up, Bogotá is emerging as an attractive destination for the first time in decades. Located nearly two miles high in the verdant Andes, the Colombian capital may be shrouded by balmy mountain mists, but it's shaking off a long period of isolation to reveal a sophisticated tableau of art, architecture and action. Cartagena  the UNESCO-lauded seafront town an hour's flight north of Bogotá  used to be the only place visited by many of Colombia's 2 million annual tourists. But Bogotá's beefed-up security means that visitors are no longer bypassing the capital in a hurry to get to the beach. Travel warnings still urge caution, but for visitors taking proper safeguards, a trip to Bogotá is finally on the cards. Nearby, the 29 rooms at the Hotel de la Opera, www.hotelopera.com.co, feature 14-ft. (4 m) ceilings and décor befitting the hotel's origins in a pair of adjoining 19th century townhouses. In its vicinity are the Teatro Colon, tel: (57-1) 284 7420  a gold-encrusted, neo-Italianate 135-year-old performance venue that is home to the Colombian National Symphony Orchestra  and Artesanias de Colombia, www.artesaniasdecolombia.com.co, a government-sponsored showcase for handmade masks, pottery, jewels, carpets and other Colombian handiwork. Afternoon is the best time to take in the views from the Cerro de Monserrate, www.cerromonserrate.com, the church and monastery perched above Bogotá at 10,200 ft. (3,100 m) and surrounded by fragrant eucalyptus. Ascend the forested hills via cable car or join the throngs of pilgrims who brave the hike by foot every Sunday morning. Back in town, the Zona Rosa remains a bastion of affluent indulgence. At Xoco Puro Chocolate, tel: (57-1) 622 0443, for instance, there are two dozen varieties of chocolates created entirely from native fruit and spices; at Club Colombia, tel: (57-1) 249 5681, smart versions of local classics such as corn empanadas or chicken-and-potato soup are served in a sprawling, renovated mansion. For postprandial diversions, check out the campy Mai Lirol Darlin, tel: (57-1) 236 5846, or the gay, electro-pop Blues Bar, tel: (57-1) 616 7126  both are filled with well-heeled, cocktail-sipping Bogatenos. After decades of conflict, they finally have something to drink to.